Sometimes you don't have to be born in Youngstown, Ohio to take on the tough, blue-collar persona that is associated with the city, such is the case of Tony Janiro. Born right outside of Pittsburgh in Springdale, Pennsylvania in 1927, Janiro moved to Youngstown with his family when he was four years old. Janiro showed promise at a young age with an outstanding amateur career which included winning the featherweight division of the Chicago Golden Gloves and the Intercity Golden Gloves, which pitted the winners from the Chicago and New York City Golden Gloves tournaments in 1943. Following his success in the Golden Gloves, Janiro left for New York City at the age of 16 to begin a professional career. Janiro made his pro debut on December 8, 1943 scoring a victory on points over Charlie Jefferies at Scott Hall, a tiny fight club located in the heart of Elizabeth New Jersey. Like many fighters of his time, Janiro stayed busy fighting 29 times in his first year as a pro, going 28-1 in those contests. Janiro, who was known as much for his good looks as he was his quick hands and good footwork, was on the fast track at a young age and was considered a top 10 welterweight for most of the mid to late 1940's however he never fought for a world title despite taking on some of the best fighters in the history of the sport. 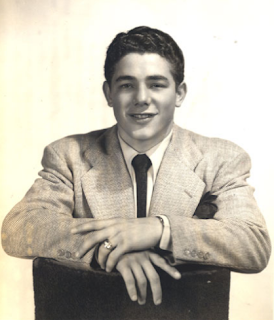 Some of the top opponents Janiro fought against included Hall of Famers Rocky Graziano, Jake LaMotta, and Kid Gavilan. The highlights of his career both came at Madison Square Garden. In February of 1947 at the historical arena located in New York City, he knocked out Beau Jack while in March of 1950 when he fought Graziano to a draw. By June of 1952 at the age young of 24 Janiro's career was over following a match in which his corner threw in the towel early in the fifth round against Charles Humez in Paris, France. Many blame the fast life of woman and alcohol for the shortened career of Janiro, but his love for fun outside of the ring including the ladies and alcohol did not stop him from compiling a very impressive 80-15-2 record according to BoxRec. In retirement, Janiro worked as a bartender at Neutral Corner, a bar that was located near the legendary Stillman Boxing Gym in New York City. During his later years, Janiro returned to Youngstown where he was employed at the Mahoning County Courthouse. Janiro, who was inducted into the Youngstown Curbstone Coaches Hall of Fame in 1984 suffered a heart attack in 1985 which caused the kidney failure that led to his death at the age of 57.